Audit4Business Sp. z o.o. was established in 2008 by former senior managers from the so-called Big4 advisory companies, with many years of experience in projects for international corporations and capital groups from a variety of industry sectors. To fill in a gap in the Polish market between large audit firms from the so-called Big4 and local audit companies. We specialise in audits of larger entities and complex transactions, also covering company mergers and restructuring. Our experience also includes involvement in drafting accounting law and regulations. We provide extensive training courses on accounting and financial analysis. 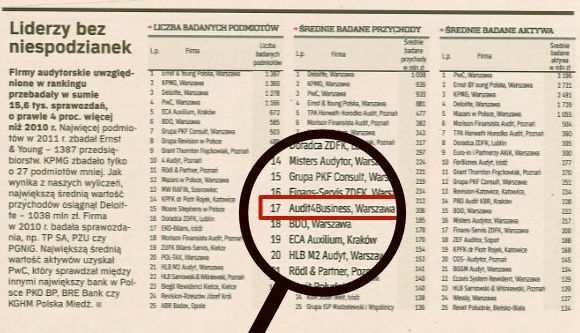 In the 11th Edition of the opinion-forming “Auditors Ranking” in Rzeczpospolita Magazine, considered as a key indicator of the market position of audit firms, Audit4Business was ranked 17th in the category of average turnover and 26th in the category of average total assets of audited companies, out of a group of the 500 biggest entities in Poland. 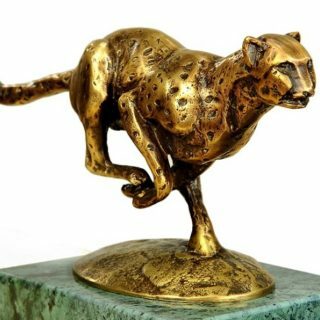 In 2015, the company was included in the group of the 400 most dynamically developing entities in the nationwide contest organised by the Institute of Modern Business and The European Firm magazine, and received the 2014 Business Leopards prize. The contest was based on the analysis of financial information from 28,918 entities across Poland.